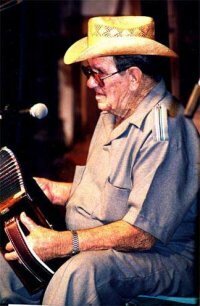 Milton J. Adams, who passed away in early July 2002, was an old time traditional Cajun singer and accordion player who continued to perform occasionally until suffering a stroke. He was born October 26, 1918, in Kaplan, where he continued to live throughout his life. According to the biographical sketch offered by Northwestern State University, his father, Elty Polite Adams, taught him to play at age 10 and by age 12 he was already playing house dances. The notes on the cassette Milton Adams Plays Traditional Cajun Music, released by Swallow Records, add that he had eight uncles who played music, including seven who played accordion. Despite his interest in music, Adams did not start performing in dance halls on weekends until he was 25. Like almost all Cajun musicians from his era, he also had a regular job, working in the oilfields and as a carpenter. As he grew older, Milton Adams and the Midnight Playboys no longer performed in dance halls, but in recent years up until his illness Adams on occasion played at festivals around the country. For decades, he shared his skills with younger musicians, including, for example, Wayne Toups, who, according to the NSU sketch, “would come to Adams’ home to play traditional Cajun music before his feet could touch the floor from his chair.” On the night Adams performed at the Liberty Theater in spring 2000, he was accompanied on stage by a young accordion player whom he had been helping.